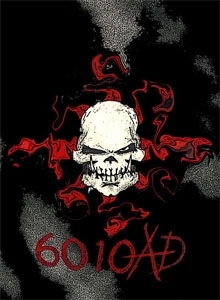 Chaos 6010 AD is a sci-fi fantasy post-apocalyptic system and setting written by Brandon Williams “Rogue” and published by Arcanum Syndicate. Chaos 6010 AD is a unique system and setting placing the characters in the midst of an alternate future of earth in the distant future of an apocalyptic event in 2206. The basics of the setting are that after this apocalyptic event, chaos consumed the planet and threw humanity into another dark age. The apocalyptic event, a massive asteroid that this the planet, created a link between Earth and other dimensions, allowing beings of chaos to pour out. Portals then opened allowing elf-like “cousins” into the world to hunt down the chaotic beings. From here, humanity’s “playground” opened up and a number of new galactic races have been encountered. However, Earth stills seem to be a shattered planet. Chaos 6010 AD utilizes a roll-over system where the dice being used are dependent upon a character’s stat or attributes and comparing them to a somewhat static target number based on difficulty. Oddly enough, the character levels rise in number to the nth degree bringing the characters from lowly humans to dang-near supernatural levels. A bit much but can produce some epic campaigns. History is a brief introduction to the setting including a timeline that lists the major events that have happened up to the point wher ethe game starts. Game Mechanics contains all the basic rules for playing the game along with an overview of character creation. I’m a fan of systems that put this section in the front as understanding the game’s mechanics can be quite important before knowing how to design your character. Races contains the detailed listing of the 21 available player character races including description, names, a brief look at their history, and all the in-game mechanic modifiers. Classes contains the detailed listing of the 20 available player character classes including their level abilities and a full description of those abilities. This also gets into multiclassing. Skills contains all the character skills including primary and secondary. The list of primary skills is nice and short while the list of secondary skills is a bit long. Combat defines all the mechanics necessary for performing and resolving combat. Magic takes a look at the different “schools” of magic (that’s not what their called, but it’s a good way of looking at them) including a list of spells, magic items, and artifacts. Weapons & Armor contains all the weapons and armor to equip your characters. All the guns are illustrated, which really helps to visualize what your character is using. Equipment is the mundane equipment used throughout adventures and campaigns. Cybernetics contains a list of cybernetics available including how they are used. Vehicles contains a list of vehicles and mechanics for ground, hover, and space vehicles including a toolkit for randomly built spacecraft. Game Master Rules contains tips and tactics for the game master to better run adventures and campaigns including examples of play, additional mechanics for things such as drugs and narcotics, guides to Earth, traps, hideouts, and a lot more. The Galaxy contains a mechanical look at the galaxy including the different solar systems and their cosmic bodies. Each cosmic body is detailed mechanically in terms of type, atmosphere, population, race, resources, and more. The Afterlife presents additional mechanics for running a character after they die. The character turns into a spirit and additional abilities apply. While interesting, it seems to lack the sci-fi cohesion of you turn into a spirit and play that way. This part seems a lot more fantasy than sci-fi. Beasts & NPCs is a collection of adversaries. This collection is quite extensive and illustrations abound. Chaos 6010 AD is an interesting collection of mechanics and themes that can create a very unique experience. There is a lot of fantasy elements to mash with your sci-fi and throw this all into a dark version of Earth’s future producing a setting that requires a lot of survival skill. There are definitely a lot of options to keep your characters alive, but if they die, there are mechanics to continue their career. All in all, it’s a lot different than most settings available with mechanics that embrace epic game play. Chaos 6010 AD is a decent looking book but loses marks for some overwhelming visual issues. The art is pretty good with smattering of pieces that are really cool. However, the layout is inconsistent and at times very non-functional. Throughout the book the layout changes from 1-column, to 2-column, to 3- column and back and forth. Sometimes there’s 1-column with a large illustration next to what could be a 2-column format. Sometimes the illustrations are within the 2-column format but not always well-placed. Some of the headers look awkward and there’s even times when the charts are in such a small font that you can hardly read them. Inconsistencies like this really detract from the quality of the book but at least it’s backed by some good illustrations. The mechanics for Chaos 6010 AD are pretty good, although I don’t understand the need to bring them to such a high level. I like systems that allow for character definition through bonuses (values) and penalties (flaws), although I typically prefer them to be simpler. At times the mechanics felt bloated such as the large number of skills which can easily be consolidated and a core rulebook with too many options. Core rulebooks should be designed with the necessities in mind to avoid overwhelming new players. There’s almost too many character races and classes along with too many types of magic. The system, however, seems to be designed for epic-style play such as you would see in a movie or comic book, and the mechanics really embrace that. From a theme stand-point, the mechanics appear to do what they intend to do. If you’re looking for some truly epic-styled playing in a sci-fi setting, then Chaos 6010 AD has a lot of great features. If you’re looking for something simple or a quick-start, Chaos 6010 AD will probably not do well. This game is made for those who like to play lengthy campaigns with characters that are given a ton of options for customization. The setting could use further fleshing out, but that can be easily remedied in future supplements. Although the term “too much” could probably be used here, Chaos 6010 AD is all about long-term games and lots of character options. The higher you go, the more epic your game play will be. Chaos 6010 AD is a lot like epic fantasy in that the game-play is continually turned up through the levels and your characters become more and more epic as they go along. It’s a very cinematic style of sci-fi and if you’re in to that, then take a look at what Chaos 6010 AD can offer.